How are projects selected ? We have identified specific communities we are focusing on, which we know and want to work with. Our contacts there are our real strength. Our short-term objectives include counselling programmes to comfort displaced and orphaned children and to help them to restore their lives. We have already undertaken two successful programmes, in Hambanthota and Matara, in partnership with the Colombo Childrens Book Society (CCBS). Our approach is very different to other aid programmes. Children who participated in the programme earned a Share & Care gift pack as a reward, rather than as a handout. Our aim is to ease the burden of school children who in many cases had lost their parents and/or siblings, as well as schoolbags and educational materials, to the tsunami. We have established a Tsunami Childrens Fund to sponsor and provide scholarships and welfare activities for affected children. We are working with well-respected Sri Lankan charities to set up childrens reading centres and libraries in tsunami-affected areas. Through our contacts on the island, we have also identified a number of individuals and families - who are already benefiting from our direct assistance through community projects. Our second long-term aim is to set up a small community with fishermen, craftsmen and shopkeepers, together with other opportunities for self-employment. We will provide essential materials (boats, nets, etc) as well as capital to start small businesses. 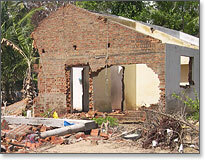 We will also assist in rebuilding homes. Progress and achievement will be monitored through our representatives in Sri Lanka.